Analysts predicted that sometime around the first week of July, the Mobile phone population of the world touched 5 billion devices mark.The global mobility is at 73%.However growth in the mobile phones devices markets continues unabated as Gartner recorded 16% Y-o-Y growth in number of mobile devices sold. However, look deeper and there are a few other interesting trends.Smartphones as a sub-category is powering growth in mobile phones. While smartphones have grown at 74% Y-o-Y as against 16% Y-o-Y growth registered by Mobile phones, Smartphones have also contributed 75% to the differential volume units in mobile devices sales. The mobile phone category is rapidly evolving and is actually moving away from brands. Sample this: While the today number of branded OEM units remained constant at 252 million, the entire growth in the mobile phone category was powered by Local brands and white label manufacturers such as ZTE and Huawei. Others, ZTE and Huawei grew 52% by unit volumes Y-o-Y. Nokia, Samsung, LG, Motorola, Sony-Ericsson, Blackberry-all the players who defined the market pre-2008 are loosing thier markets. Consumers in mature markets are choosing entry-level and mid range Android smartphones over feature phones, partly due to carriers’ and manufacturers’ promotions. Local ODMs are making decisive inroads into the markets basis a better value equation and prices on their handsets. Operators are also increasingly looking at the device bundle space to support value propositions to consumers. Mobile phones category is one where value-for-money is winning over the brands proposition. Do we term this as commoditization? In some sense, yes! 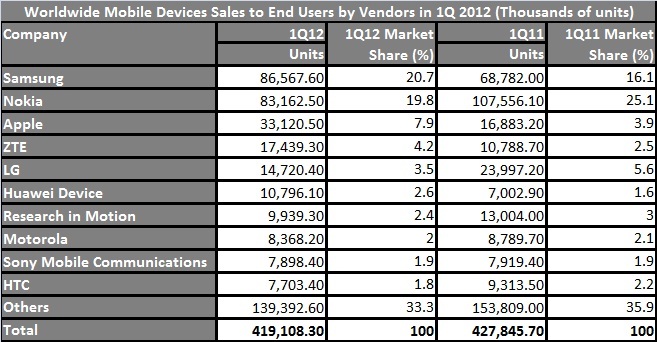 The Q2,2011 mobile phone shipment volumes and the market share report by IDC has a few interesting take aways. 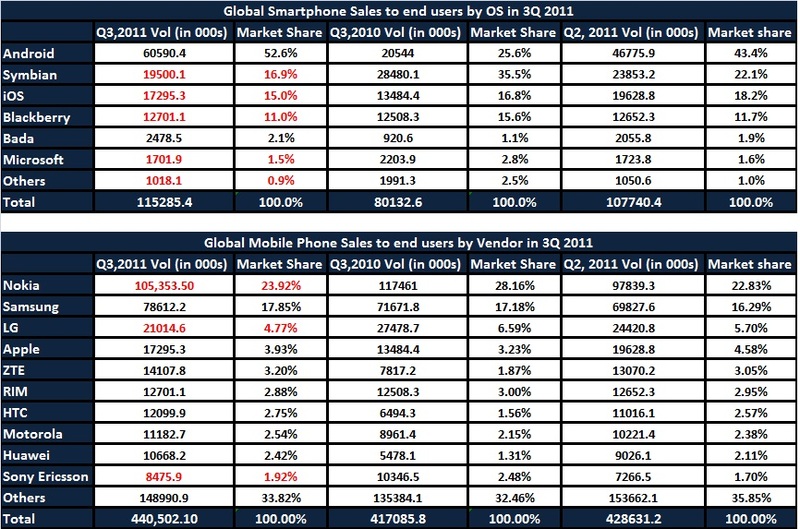 The report estimates that worldwide mobile phone market grew 11.3% year over year in the second quarter of 2Q 2011, despite a weaker feature phone market, which declined for the first time since 3Q09. Vendors shipped 365.4 million units in 2Q11 compared to 328.4 million units in the second quarter of 2010. The 11.3% growth was lower than IDC’s forecast of 13.3% for the quarter and was also below the 16.8% growth in 1Q11. 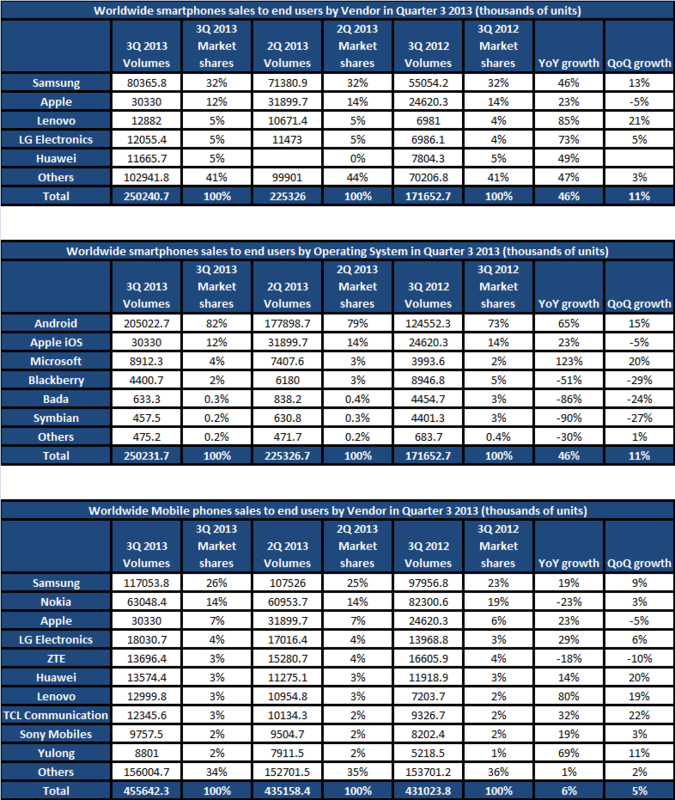 However, the feature phone market shrank 4% in 2Q11 when compared to 2Q10. The decline in shipments was most prominent in economically mature regions, such as the United States, Japan, and Western Europe, as users rapidly transition to smartphones. This was the first decline since Q3 2009 and reflected a combination of conservative spending and continued shift to smartphones. For the overall market to grow by double digits year over year, despite the decline in feature phones, is testament to the strength of the global smartphone market. While this is not a new trend – smartphones have been the primary engine of growth for the last several quarters. 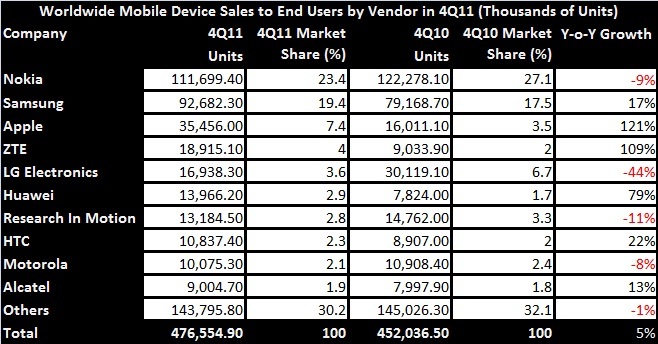 However, the 2Q 2011 timeline is an milestone, because it does mark something of a transition point, as demonstrated by the growing number and variety of smartphones featured in the vendors’ portfolios. One might as well add a subdued demand from Japan given the Earthquake and component shortages. In the OEM space, the same story plays out with Nokia loosing close to 10% market share and with shipments falling 20% YOY. High channel inventories in China, competition from Samsung in mi end and Chinese white label manufacturers in low end and a free fall on the smartphone space have led to Nokia’s loss. The story rings the same for LG as well which lost 19% YOY and 3% market share points. Samsung which has had an impressive run lately both in entry and mid level in Europe and Asia and has catapulted to No.2 slot on the global smartphones list has registered 10% growth which is a shade lower than the 11% market expansion. Apple thrived in China thanks to strong iPhone 4 demand. If Apple was to release a low cost iPhone as rumored, it could make major inroads and overthrow LG from the no.3 spot. That is quite phenomenal considering that Apple did not sell phones till about 4 years back. China-based vendors gained share in India, West Asia, Africa and Southeast Asia at the low end. In Western Europe, the market declined sequentially compared to the first quarter. The feature phone market declined while smartphone shipment growth slowed as phone makers and carriers reduced inventories in advance of expected third-quarter product launches. Civil unrest in West Asia, North Africa and other Arab countries, impacted sales negatively. In North America, smartphones once again took center stage, propelled by lower prices, key device launches, and enhanced channel marketing. In particular, Android-based devices extended their lead in the United States and took leadership in Canada thanks to Samsung, Motorola, HTC, and LG. Meanwhile, demand for feature phones continued to slide, but there still existed pockets of interest for voice-centric and quick-messaging devices. The Latin America market growth was driven by low-cost smartphones, specifically those with social networking features. Lower smartphone prices, including those of the Android variety, are driving smartphone penetration in several Latin American countries. Price is expected to be a point of differentiation – as well as applications and device features – between Android players in future. Nokia stocks took the hammer today and haemorrhaged 17.5%, following a dramatic downgrade of its 2Q,2011 outlook. Nokia expects net sales from its Devices and Services division to be substantially below its previously expected range of 6.1 billion euros to 6.6 billion euros ($8.77 billion to to $9.48 billion) it previously expected. Nokia expected to earn somewhere between $530 and $850 million off its Devices and Services business this quarter, and now expects those figures to be “substantially lower”—right around a breakeven point. The second quarter results are expected by July 2011. Nokia’s full market capitalization now stands at $25 billion, a figure that analysts say that Apple Inc. could earn in net profit alone during 2011. Nokia in a statement has indicated that it could no longer give a full year forecast which effectively means that Nokia is pessimistic/unable to react to and contain losses that the phone major is beginning to see all around its business units. The lack of revenue assurance is a psychological set-back which manifested itself by a free-fall in share prices. 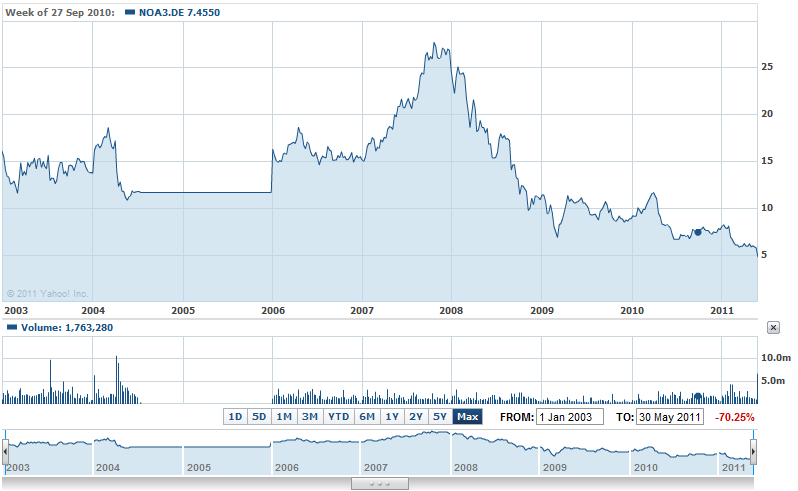 Nokia was trading at 4.34 Euros, its lowest in the last 13 years. Bernstein Research downgraded Nokia from “market perform” to “underperform” on Wednesday, cutting its price target to 3.00 euros from 5.50, and Goldman Sachs removed its “buy” tag on Nokia, labling it only as “neutral”. Nokia attributes the lowered forecast to three primary factors, including aggressive pricing from competitors, lower average prices and margins across its own product line, and “competitive dynamics and market trends,” particularly in China and Europe. However, the bottom line is that Nokia isn’t selling as many phones as it would like. Check Gartner reports here. The problem with Nokia is that they are losing market share at such a pace that there’s a risk that consumers won’t be interested in buying Nokia phones anymore. That could whiplash into inventory blockages globally which could further dent the channel confidence in Nokia. Nokia’s market share had fallen to 29 percent from 33 percent in the first quarter of 2010, and compared with 40 percent in the first half of 2008. The numbers are stark. In the first quarter, Google’s Android operating system ran on 34% of smartphones in Western Europe, up from only 8% a year ago. By comparison, the percentage of smartphones that ran Symbian fell by half to 21% in Europe from 40% a year ago.The influx of Android devices aimed at both the premium and mass markets has Nokia cornered. Nokia states that sharp outlook downgrade was part of a rocky transition period as it phases out its Symbian smartphone platform in favour of a tie-in with Microsoft Phone, and hopes to regain lost ground when it starts shipping its first Microsoft handsets at the end of this year. While Nokia has been announcing launch of its Windows phones by 4Q,2011, there are unanswered questions about costs, eco-system and consumer acceptance. Then again, a 4Q,2011 launch would mean that Symbian led smartphones would continue bleeding in volumes as well as ASPs. In an initial estimate I had predicted that the next 3 quarters could see the Symbian-Nokia at 10% of the smartphone sales. Nokia already has transferred maintenance of the out moded Symbian platform to Accenture and laid of 7000 jobs thereby saving its $1billion this fiscal. Nokia has started shipping dual SIM phones, a trend that it missed altogether in 2007-08 and has also announced the E7 shipping start. It is doubtful that these are going to alter the balance any more in favour of the beleaguered mobile giant. Nokia’s crisis has been in the making for the last 3 years. There has hardly been a Nokia phone to write home about except the E70 in 2008. Each of its flagships failed post that as Nokia was stuck in its device and hardware focus and Android / iOS stole the march with swanky OSs and smartphones. Nokia misread the evolution of the smartphone category, touch and did not execute most of the elements in its service strategy well (Ovi??). Worse, the organization as such was a sloth and as the joke goes, Nokia was the proverbial oil tanker that took ages manoeuvring in any direction. For 3 years after the launch of the iPhone, the writing and the trend was on Nokia’s face but it did not react compounding the crisis. The Q2,2011 outlook downgrade is the proverbial tipping point and I expect small disasters ahead. We will wait to know if Elop’s Windows Phone association does anything to reverse the fortunes of the beleaguered giant. Mobile phones device sales increased 19% Y-o-Y to total 427.8 million units in Q1,2011, On the same lines, Smartphone sales registered a 85% increase and accounted for 23.6% of overall mobile sales in 2011. 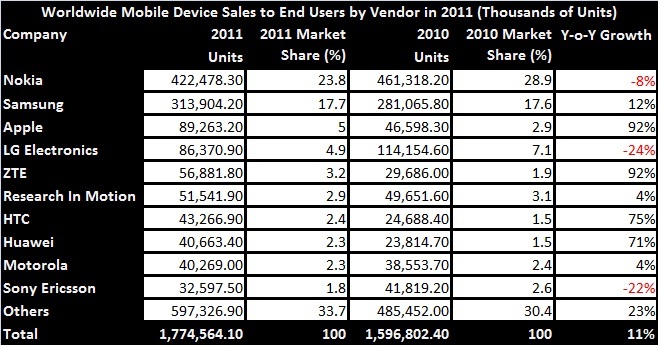 Smartphones registered 100.8 million unit sales in 2011. Smartphone numbers have seen a depression due to the situation in Japan and the fact that buyers haven’t invested in smartphones in Q1,2011 anticipating stronger and bigger device releases in Q2,2011. The smartphone numbers only re-inforce the familiar rise of Android to Ubiquitous status, the marginalization of Symbian in Smartphone OSs and pressure on Nokia to defend its leadership. Symbian lost 24% share in 9 quarters, whereas Android gained 35% of its market in the same 9 quarters propelling the likes of HTC to No.7 in Devices and lifting the ASPs for Motorola, Sony Ericsson and Motorola. Android currently is in the mode of moving into the $100 price feature phones to get into the mass mode. Nokia’s move from Symbian to Windows was announced this February and there is a 1 year or more waiting time before the Nokia Windows Phone hits the shelves. In the meantime, consumers are expected to shy away from Symbian and thus in the ensuing quarters, Symbian market shares are expected to free fall further. By the time, the Windows tie-up kicks in for Nokia, Nokia could well be around 10% market share points and combined with Windows, it would claw back to 20% but never really challenge the dominance of the Android OS, eco-system and partners. With presence across 90 countries from 186 CSPs, Apple has doubled its number of units sold Y-o-Y. It is unlikely that Apple will push past the 20% market share in Smartphones majorly, but the unique eco system of devices, applications, platforms and services would make it the most profitable mobile platform. In the first quarter of 2011, RIM announced that it would transition its BlackBerry portfolio to the QNX platform in 2012. This should make its smartphones more competitive in graphics, performance and touch, and unify RIM’s tablet and smartphone user experience. Windows devices launched at the end of 2010 failed to grow in consumer preference and CSPs continued to focus on Android. In the long term, Nokia’s support will accelerate Windows Phone’s momentum to double figures. 1. 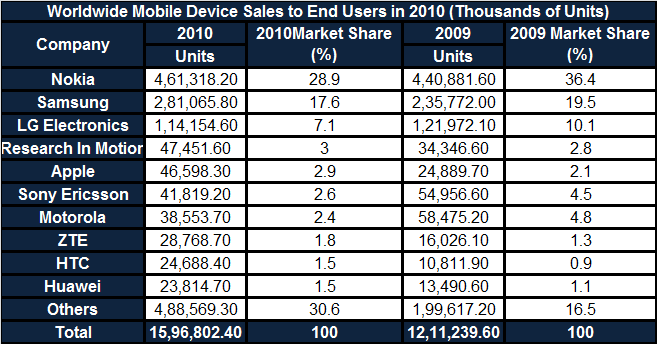 Smartphones globally have grown by 83% to 101m (In Q1,2011) from 55.2m (In Q1,2010). However the markets have been flat Q1, 2011 over Q4.2011 with sales at 101million. 2. As against an estimated 80-84 million PCs shipped in the quarter, Smartphones have over sold PCs second quarter in succession. 3. Android, Apple and Bada have grown in the flat market whereas Symbian, Blackberry, Windows phones and others have lost footing. 4. APAC emerges as the largest market for smartphones accounting for 40% of smartphone shipments (inspite of Japan’s poor show due to the earthquake). APAC has doubled its smartphone shipments (37.3 million) with biggest smartphone growths registered in China, South Korea and India. 5. US remained the largest country for smartphone shipments. Apple has substantially extending its lead, achieving a share of 31% device market share and growth of over 150% year on year. Volumes were boosted significantly by shipments of the iPhone 4 with Verizon Wireless. 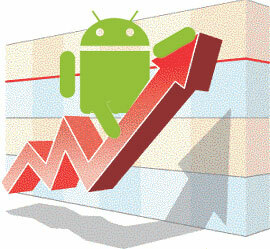 Android remained the leading smart phone platform in the US for the third consecutive quarter, with a 49% share. Growing by well over 200%, HTC became the leading Android vendor in the US and the second-place smart phone vendor in the country overall. 6. Android emerges as the No.1 OS second quarter in succession and the trend does not look like changing any time soon in the future. Canalys expects Android to grow twice as fast as others in 2011. 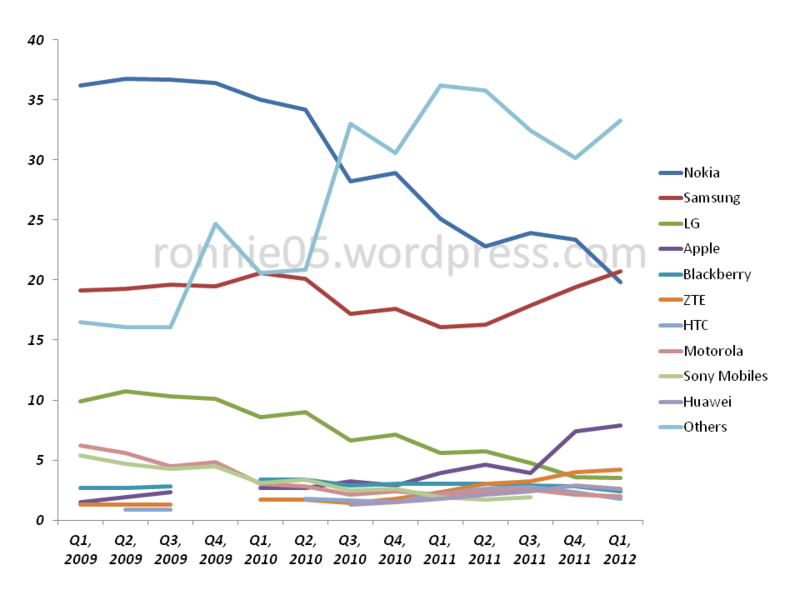 Android has registered a 35% market share, up by 7.2% against Q4,2010. Overall, Android shipments were helped by strong sales by its vendors including HTC, Samsung, LG, Motorola and Sony Ericsson. 7. 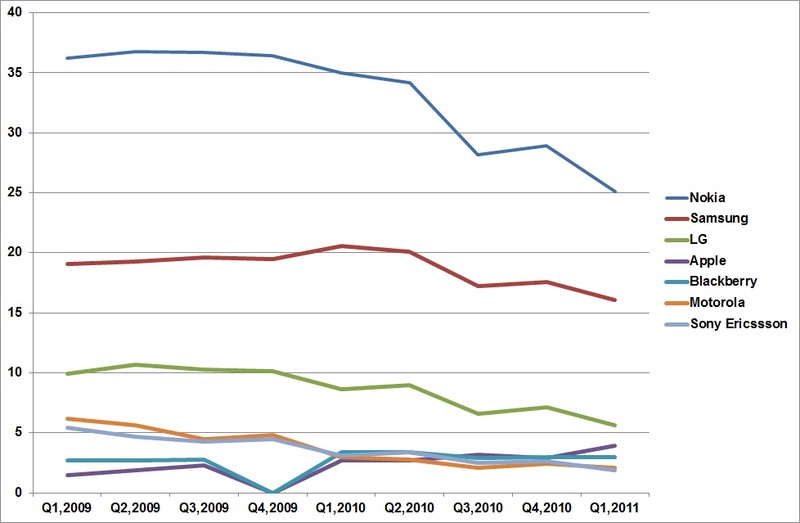 Nokia’s lost 15% share points and dropped from 39% smartphone share (with 21.5 mln volumes) in Q1,2010 to 24% in Q1,2011 (with 24mln volumes). Of these 9mln Nokia smartphones were sold alone in China and APAC region shipments contributed for 53% of Nokia global smartphone sales. Nokia sales fell 22% QOQ. Nokia has launched a few Symbian based smartphones which are expected to help Nokia’s smartphone numbers before it gives way into WP7 early next year. Nokia is under considerable strain in the smartphone market as it transitions strategy, platforms and people and that is showing through. 8. Apple with its double operator/ CDMA phone strategy grew 18% over Q4,2010. 9. Blackberry also shared the similar faith as Nokia with the wind being knocked out of its sails and registered a 4% QOQ drop. It returned a 14% market share in Q1, 2011 as against 19% in Q1,2011. 10. Samsung shipped nearly 3.5m phones running its Bada OS – which Canalys says outstripped total shipments of Microsoft’s Windows Phone OS, launched in the fourth quarter of 2010. This shows that there is still room for multiple operating systems, and that vendors can benefit from maintaining control of device development to hit the right markets and price points.